Mad cow disease is the sinister name for bovine spongiform encephalopathy, and it's deserved. Though not contagious through person-to-person contact, mad cow disease is terrifying for its deadly effects. The disease, which manifests itself as Creutzfeldt-Jakob disease in humans, gradually destroys nervous tissue in the brain, resulting in dementia, memory loss, seizures and death. The disease is incurable and always fatal. Humans can contract the disease by eating brain or spinal tissue from an infected cow, parts of which can be contained in ground beef or some other contaminated cuts if proper safety measures aren't observed. The largest outbreak occurred in Britain beginning in 1984, killing more than 150 people. 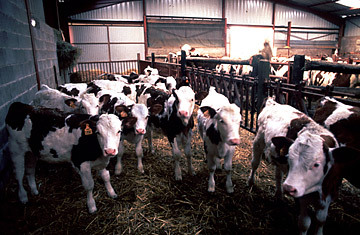 Infection has been kept down largely by rapid quarantines of infected herds and changes in feeding practices that prevent cows from being fed the ground remains of other cattle  a common way the disease spreads. See 10 ideas changing the world right now.